No-Bake Vegan Almond Joy Bars - Just 4 Ingredients! 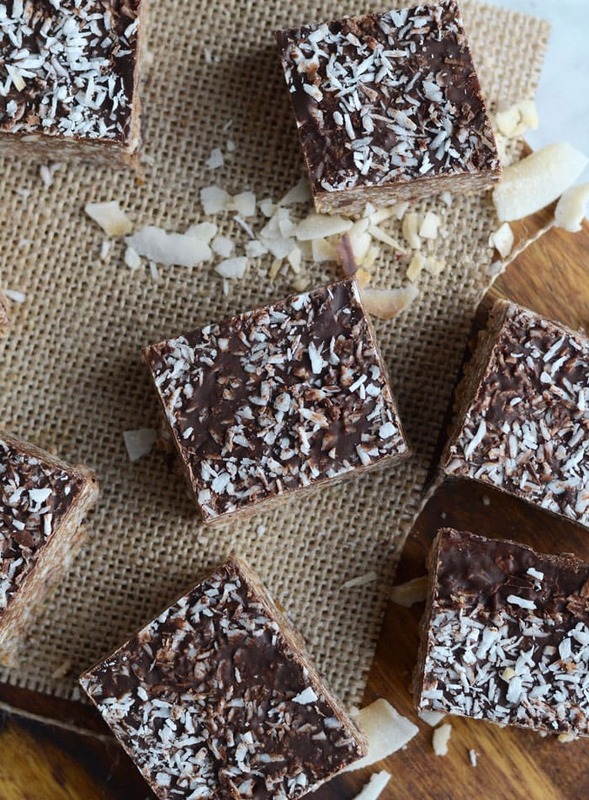 If you love coconut, almond and chocolate, you will love these amazing no-bake vegan almond joy bars! You only need 5 simple ingredients to make them, no baking required and they’re absolutely perfect for both snacking and dessert. The only downside to these bars is they’re highly addictive. If you’re a big fan of a chocolate and coconut working together in chocolate coconut harmony, you’ve been warned. 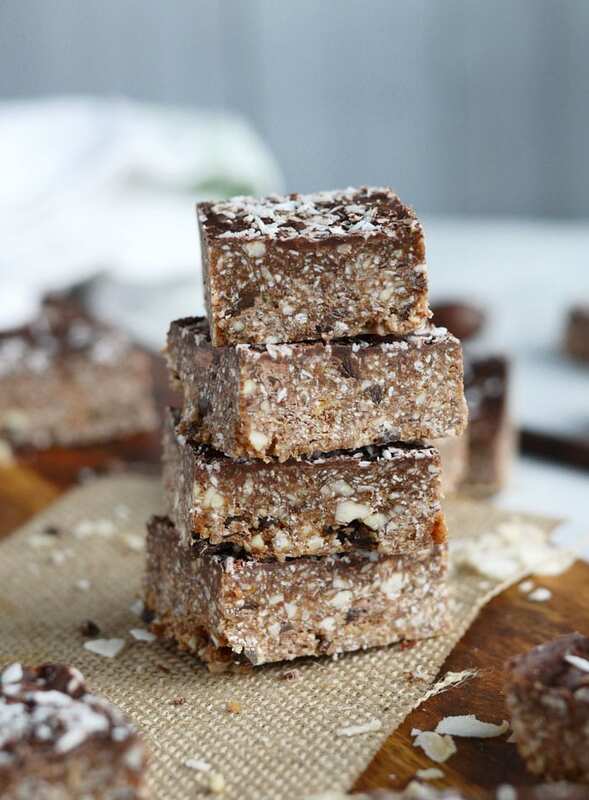 Because of the coconut, almond and chocolate these vegan almond joy bars are a bit higher in fat than some other no-bake bar recipes I’ve shared. That being said, these bars contain a good ratio of carbohydrates, fat and protein, making them well-balanced and energizing. If you’re after something lower in fat, check out my Gingerbread Cookie Dough Balls or Nut-Free Oatmeal Raisin Bars. 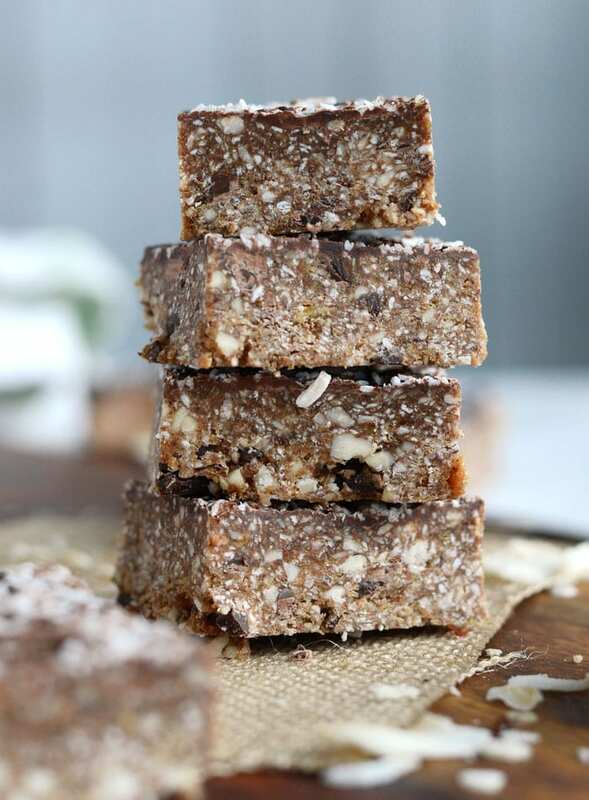 Even with a bit more fat in these bars, with just 5 wholesome ingredients they’re still a much better dessert option than a store-bought candy bar and personally, I think they taste way better. Plus, you can feel good knowing exactly what went in to them: chocolate, coconut, almonds, dates, pure maple syrup and most importantly, love. Awww. These are a great choice for bringing along to potlucks, taking to the office or sharing with friends and family. Not only will the recipients love you for sharing such a delicous treat but that way they the bars won’t be sitting in your kitchen taunting you to eat them all, like mine are right now. These are going straight to work tomorrow! It might be hard to let them go but sharing is caring, I guess. 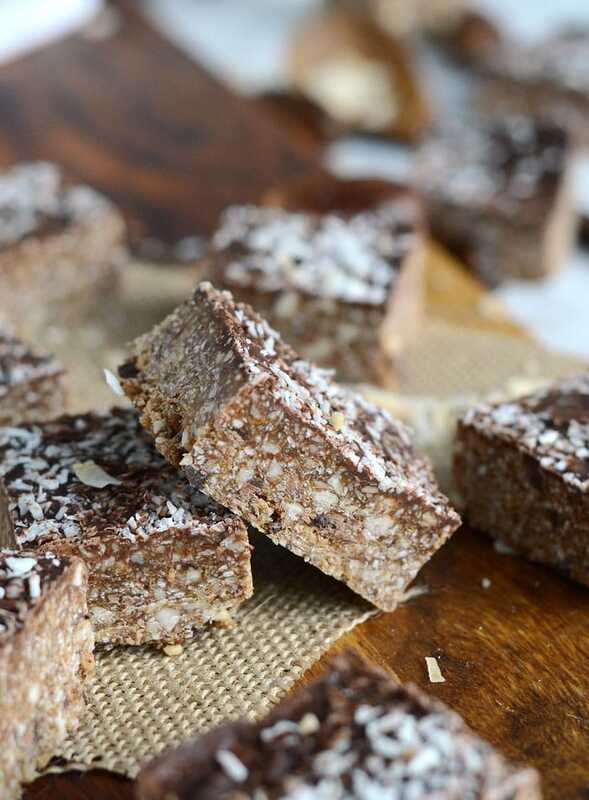 These vegan no-bake bars are my new favourite treat. They are so, so dang good. Almond, coconut and chocolate are perfect together and all blended up with fresh, soft dates, the chewy texture with crunchy chocolate is amazing. These have a lot of coconut in them, 2 cups of unsweetened shredded coconut to be exact, so you’re welcome, coconut lovers. 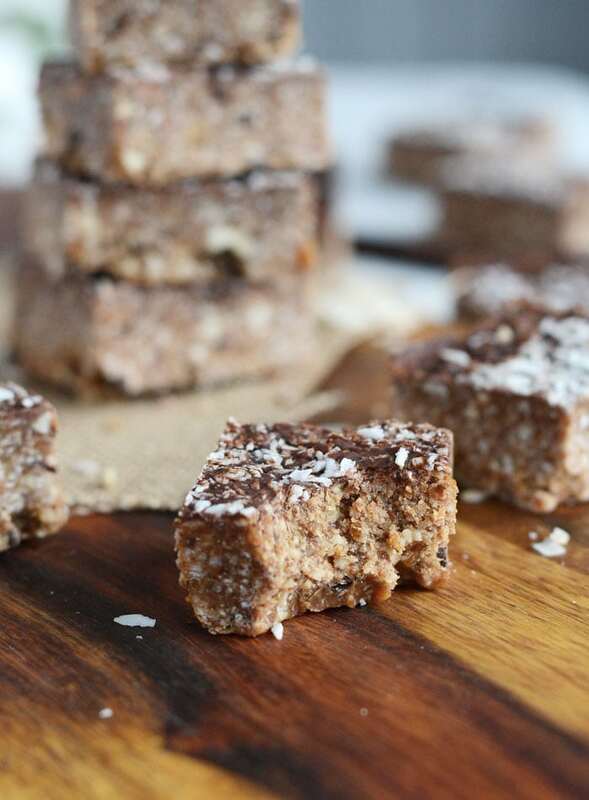 Bonus…all you need to make these bars is the coconut and 4 other simple, ingredients! Almond. JOY. So easy! Blend, press, cut, eat. I think you could get away without adding the maple syrup but it’s up to you! I decided to add just a little extra sweetness to these but if you don’t have any or want to leave it out that should be no problem. 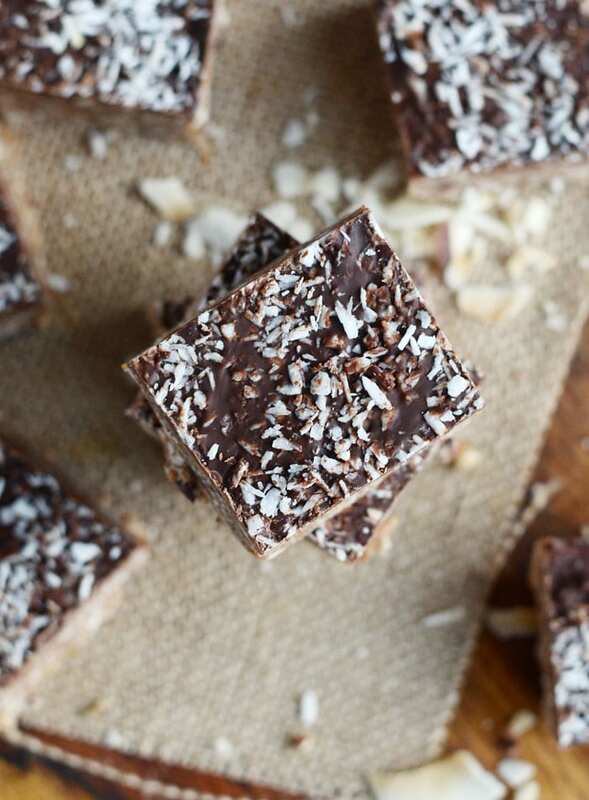 As for dairy-free chocolate, I used my favourite Enjoy Life Mega Chunks in this recipe but any chopped dark chocolate or vegan chocolate chips would be delicious. You can use Lily’s Premium Dark Chocolate Chips for a sugar-free option. I also added a bit of Simply Organic Almond Extract to mine to really bring out the almond flavour. You could add a little coconut extract too if you had some on hand! Add the coconut to a food processor and processor for 5-10 minutes unit it starts to form a paste. Add the almonds and dates and mix until it forms a thick dough. Add the almond extract if you’re using it. Add the chocolate and pulse a few times to combine. Line a square baking pan with saran wrap or parchment paper then firmly press the dough into the pan taking a few minutes to work it into all the corners and smooth it out. If you want to top it with a layer of chocolate, melt 1/3 cup chocolate (up to 2/3 cup if you want a thick chocolate layer!) on the stovetop or in the microwave then spread it over the bars. Sprinkle a little coconut on top, if desired. Lift out of the pan and cut into 20 bars. I love no-bake recipes! This recipe makes cooking easy and enjoyable! Thank you Deryn, no-bake recipes are the best! There is definitely one best way to eat almond and this recipe of yours just prove it. Thanks a lot for sharing this one. Definitely a lot of your readers now are eager and excited to try this one and serve it to their family and friends. Most amazing bars EVER! Now I’m just trying to keep myself from eating all of them at once! Hahaha, I know, it’s so hard!! I’m so glad you enjoyed them. Feel free to send some my way if you’re worried you might eat them all at once 😉 Thanks for the comment!